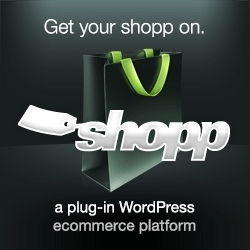 Shopp is a fantastic e-commerce plugin for WordPress that I’ve been working with for a couple of years now. I’ve been developing a couple of plugins to enhance the functionality of Shopp. Shopp Minimum Order – set a required minimum order amount, either a number of items or order total. Shopp Daily Deal Discounts – Are you running a “Daily Deal” style promotion for your online store? Do you need to generate (or import) hundreds or thousands of one-time use promo codes? Then this plugin is the answer. Coming soon! Shopp Customer Session Browser – How many customers are browsing your site now? What items did they put in their cart? Did they enter a promo code and never check out? This plugin will help answer these questions. Coming soon! Would you like to get updates on new WordPress plugins for Shopp? Just enter your email address below; I promise I won't spam you, ever (the only spam I like comes in a can).